Heat oven to 350°F. Line 15x10x3/4-inch pan with heavy-duty foil, extending foil over sides of pan. In blender or food processor, blend or process cereal until fine crumbs form. In 2-quart saucepan, melt butter and brown sugar over medium-high heat 3 to 5 minutes, stirring frequently, until mixture boils and coats back of spoon. Remove from heat. Add cereal crumbs; stir until well combined. Spread and press evenly in foil-lined pan. Bake at 350°F. for 7 minutes. Meanwhile, cut cookie dough into 16 slices. Remove pan from oven. With hands, flatten cookie slices slightly; arrange on hot cereal mixture in 4 rows of 4 slices each. Let stand 2 to 3 minutes to soften dough (heat from cereal mixture will allow unbaked cookies to become warm and easier to spread). With spatula, press and carefully spread dough evenly over cereal mixture. Return to oven; bake 12 to 14 minutes or until puffed and golden brown. Remove pan from oven. Sprinkle chocolate chips evenly over top. Return to oven; bake an additional minute. Remove pan from oven; spread softened chocolate chips over cookie layer. 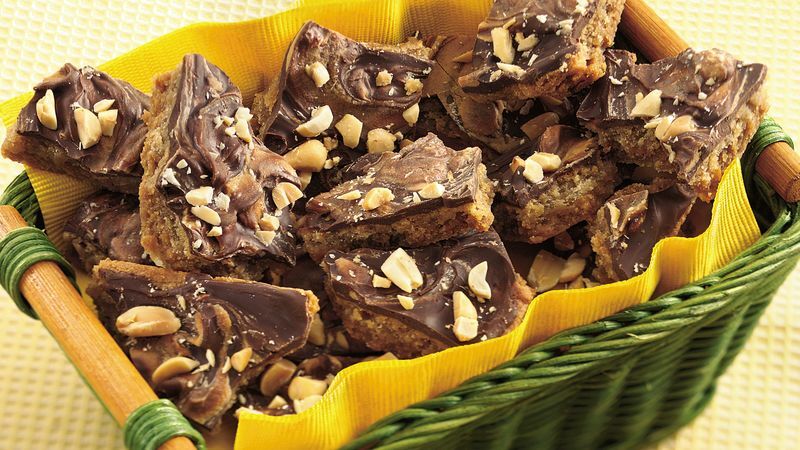 Sprinkle peanut butter chips evenly over chocolate. Return to oven; bake an additional minute. With foil, lift bark from pan; break into 2-inch pieces. Store in refrigerator. *Bark can be cut into bars after refrigerating for 1 hour.